Congolese legend-in-making Serge Ibaka talks about his hopes for the season ahead with the Oklahoma City Thunders, his relationship with his daughter and why he thinks giving back to African youth is so important. Serge Ibaka was born in Brazzaville, capital of the Republic of the Congo, on September 18, 1989 into a family of basketball players. His mother Amadou Djonga played for the DRC while his father, Desiree Ibaka, played for the Republic of Congo national basketball team. 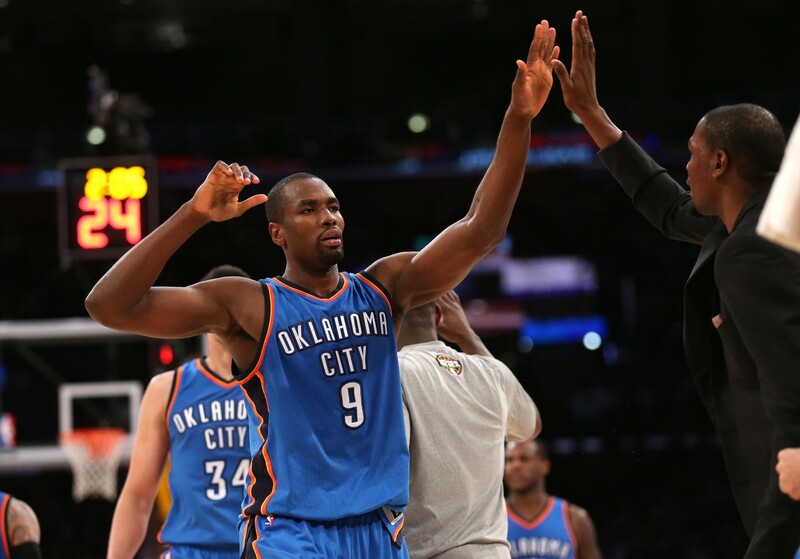 Growing up in a tough environment affected by a civil war was not easy; Ibaka lost his mother and family members. But basketball was the number one constant in his life and he knew that he would become a professional player and help look after his large family of 17 siblings. Over the years, as I have covered Ibaka from Spain to the NBA, he’s always had both passion for getting better each day as a player but also a commitment to giving back to the continent as a whole. 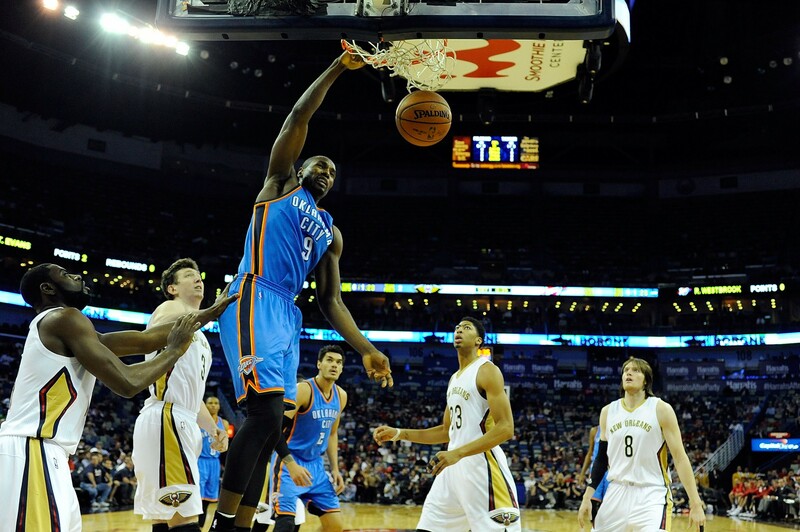 Ibaka’s rim protection and shooting range make him an ideal option at centre for the team. Last season, Ibaka played 64 games before he got injured – along with his two All-Star teammates Kevin Durant and Russell Westbrook – which could explain why the Oklahoma City Thunders missed out on the playoffs. The current season is now well underway – Durant is about to enter free agency next summer and star player Westbrook now dominating the OKC – but Ibaka’s return this season to OKC is very exciting. The 26-year-old shot-blocking extraordinaire has three All-Defensive First Team selections to his name; he ranked number 15 league-wide as a defensive player; and he’s a potential ace in the hole for new coach Billy Donovan. Ibaka’s rim protection and shooting range make him an ideal option at centre for the team: he lets the defense-less Enes Kanter stay on the court; he provides spacing for Oklahoma City’s playmakers; and he can match up with big fours like LaMarcus Aldridge, athletes like Blake Griffin, bruisers like Zach Randolph, and versatility guys like Draymond Green. So what I wanted to know was what’s next for the OKC team and Africa’s finest? Last season was bugged with injuries for OKC and it was incredible that the team still managed to get 45 wins. What is the number one aim for you personally and also for the OKC squad? For me personally, the number one goal would be becoming an All-Star and being Defensive Player of the Year. But for the team, it is obviously to win a championship, which is more important than personal accomplishments. You play this game to win championships, and our team has worked really hard over many years to get to that point. A lot of my success comes from defense and energy, which does not always show in statistics. Russ, KD, and I have not been able to be healthy for a full season and playoffs in a long time. So, if we can stay healthy, I think we have a great chance of winning. You have never been called up for the NBA All-Star, is that a goal for you this season? Of course, it is a goal for me. Everyone wants to be rewarded for their individual play. A lot of my success comes from defense and energy, which does not always show in statistics. But I keep working hard on my jump shot and passing and if I keep playing well, it would be an honour to be chosen to play. I enjoy working and I am proud of my progress each year. But I’m never satisfied and I always want to improve. ALSO SEENBA Africa… Why was Africa chosen? How hard or easy is it for you to be a dad in the NBA to a young daughter, but also to be the main provider for your whole family? And in some cases, your whole community? It is obviously very tough, but it is also a blessing. With our schedule, we travel a lot, so it is hard to see my daughter sometimes. But she has been the highlight of my year so far. We have had such an amazing time together here and I am so thankful for God giving me such a beautiful girl. I want to be very influential and remembered in Africa, but I want to be remembered for my actions. It is not necessarily hard to be the provider for everyone though. As I have said before, I was chosen by God to do something bigger and better and to make it out from the Congo and be able to be who I am. Giving back makes me so happy. I love taking care of people and inspiring them. I watched you at the Creativity World Forum this year and I was taken aback by the emotional and passionate interview you had with Sir Kir Robinson as you spoke of your dream to become a basketball player. It is clear that your passion has come from your experiences growing up in the Congo. You do a lot to offer opportunities to other young people in Africa, not just in the Congo, through your work with UNICEF and most recently, your work to fight Ebola with Luc Mbah a Moute. Why is it important for you to give back to Africa? And what legacy do you want to leave behind? Well not everyone is as fortunate as me, especially those who are from Africa. It is not just my country, but the whole continent which has my heart is. So I love giving back to where I came from. I am so lucky to be who I am and be in the position I am in. God really did so much to help me. So I always want to return the favour. I want to be very influential and remembered in Africa but I want to be remembered for my actions. There are so many people struggling in my country, and just like my big brother Dikembe Mutombo, I want to be able to help in any way I can. I want my legacy to be more than just a basketball player. I want to bring joy and hope to so many people, and I want to help as many as I can. That’s the reason I started the Serge Ibaka Foundation. What will be your most defining moment in the NBA and your contribution to Africa? That is tough because I am just 26 and believe I have so much time left. In the NBA, I want to be remembered as a great player, but I don’t want there to be one defining moment. I want people to look back on my career when I am finished and be impressed with my story; how I got to where I did; and how I accomplished what I did. For Africa, I want to keep helping out. Even after I am done playing I will continue helping through my foundation and other foundations. You can never give back enough. I want to be able to have an impact on young people, so they can start their own journey. I want them to think that anything is possible. This is an exciting season for Ibaka and despite being just 11 – 8, the Thunder is third in the Western Conference as of Saturday. It’s way too early to predict the Western Conference pecking order but hopefully they will go on to make the playoff this season. But most importantly, I look forward to seeing Serge Ibaka being called up for the All-Star in February in Toronto, where I will be attending to witness this milestone in his journey. A great asset to our continent, Ibaka is someone we should all follow and support, simply because his story and journey will inspire change where ever you are in the world.